Justice V.R. 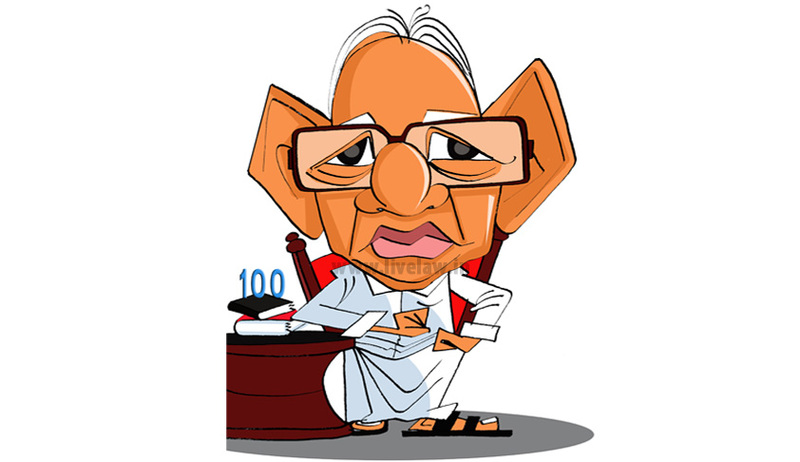 Krishna Iyer, the man who is considered as the “judicial conscience of India”, the one responsible for “humanizing law in India”, turned 100 this month, achieving milestones and setting new ones, throughout the journey. Our country has had several intellectually enlightening judges. Their opinion and insight has sculptured the progression of justice in the country. But Justice Krishna Iyer’s opinions travel far beyond mere expansion of the legal mind. It beseeches influences and stirs our conscience to be better human beings. In this sterling excellence, Justice Krishna Iyer stands tall and alone. Justice Krishna Iyer was born on November 15, 1915, and his birth date is being celebrated on Saturday. He is to be felicitated by citizens of Kochi on November 16 at the Durbar Hall ground. The function is to be attended by the CM and the Leader of Opposition. Justice Iyer holds the rare distinction of being first a Minister in State a Cabinet and later a Judge of the High Court and Supreme Court. He was the Law Minister of Kerala in the first democratically elected Communist Government led by E.M. Sankaran Namboodiripadu. The government was later dismissed by Nehru Government by misusing Article 356 for the first time in Indian Constitutional history. In 1968 he was appointed as a Judge in the High Court of Kerala and in 1971 he became a member of Law Commission of India. His appointment to Supreme Court in 1973 was protested by leading members of the bar including Soli Sorabji because of his affiliation to the leftists. “He will gracefully respect you, but don’t expect him to stop speaking out his mind,” says Kochi Mayor Tony Chammany, recalling his interactions with the legal luminary. The humility with which he carries himself, oblivious of the number of souls he inspires with every word of his is extraordinary. Justice Iyer has passed some path-breaking judgments, shaping the way justice is served in India. Sunil Batra v. Delhi Administration, the case which earned him the title of “Father of prison jurisprudence”, declared the practice of keeping undertrials with convicts in jail as inhumane. The Judicial opinion in the case of Ratlam Municipal Council v. Shri Vardhichand laid the foundations of the responsibilities to be observed by a local municipal body, giving people the access to enforce public duties and held that municipalities and corporations are responsible for sanitation facilities. Expanding the scope of Article 21 to include liberties of travel in 1978, in the case of Maneka Gandhi v. Union of India case, Justice Iyer noted, “Personal liberty makes for the worth of the human person. Travel makes liberty worthwhile.” His judgement in the Indira Gandhi case in 1975 was controversial, and earned him both accolades and criticism. It was Justice Krishna Iyer’s judgement that snowballed the political crisis, leading to the imposition of the emergency. Constantly bearing in mind the needs of the society at large, in July 2010, Justice V.R. Krishna Iyer was one of the few who garnered support to a campaign to introduce Islamic Banking and Finance in India, reasoning that Islamic Banking provided the humane face to the business of banking and it took in to consideration the needs of the poor with kindness and compassion.